Perfectly suited for the storage of pathology specimens and records, we are very excited to add our new stainless steel Histology Storage Cabinet to our ever-growing Labstuff range. Flexible - Slides, wax blocks or a combination of both, you can build your cabinet to suit your laboratory needs! Adaptable - Systems can range from a single cabinet to up to ten high, allowing you to build as you go or sort your storage all at once! Robust - Powder coated stainless steel, zinc-coated on the outside for extra long-life protection. 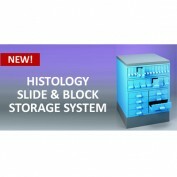 For more information, check out our full Histology Storage range online, or get in touch to speak with one of our experienced sales representatives either by phone on 01256 811118 or email at [email protected].